A simple photo. An apple. I have been trying to eat less sugary treats lately and I find eating an apple (yes, I know it also contains sugar) helps curve my craving. Less lollies and more fruit. A nod to a quote I love: "Candy is dandy but fruit helps you poop" Thank Kim Pssible for that quote. I try and remind myself of this when I was the sugar. 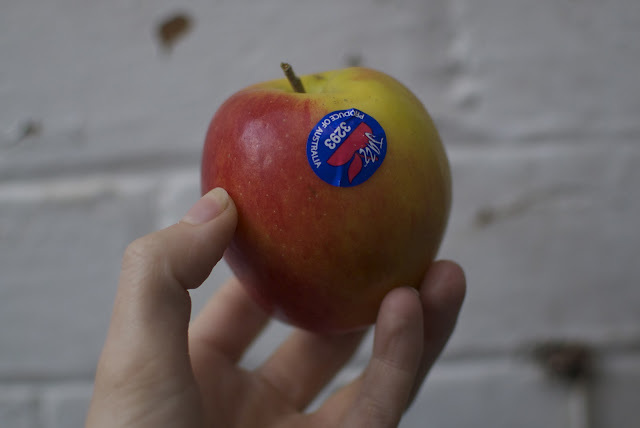 The Jazz apples are delicious, they are more expensive than Red Gala but a lot tastier. I have been converting everyone to the delicious Jazz apples.